Although proprietary applications still dominate imaging informatics, the allure of open-source applications is ever present. Who doesn’t want inexpensive, scientifically validated, customizable solutions to the myriad problems that surface in modern practice? Some experts believe that as the field of imaging informatics develops, open-source solutions will play an increasingly important role in basic imaging research as well as clinical diagnostic and therapeutic practice. However, open-source applications rarely get as much attention as commercial apps. This dearth of exposure is usually evident at medical meetings, where vendors are willing and able to showcase their latest products, and open-source solutions are often viewed as curiosities. The Society for Imaging Informatics in Medicine (SIIM) is trying to change that. At this year’s annual meeting in Orlando, open-source applications will have an opportunity for some added exposure. For the fifth straight year it will host the Open Source Plug Fest, a showcase dedicated to open-source tools. The Open Source Plug Fest will take place on Thursday, June 7 from 11:45 am to 1:15 pm in the demonstration area of the Exhibit Hall in the Cypress Ballroom of the World Center Marriott. “There isn’t really that kind of construct at most meetings, and I think folks who do open-source development usually end up presenting their work as part of a scientific presentation,” says Tessa Cook, MD, PhD, a radiology resident at the Hospital of the University of Pennsylvania and a cochair of the 2012 Open Source Plug Fest. The Open Source Plug Fest provides an opportunity for developers to bring their work to a wider audience. It also allows attendees to get hands-on experience using the tools. This interaction is vital to open-source applications because, by their nature, they are designed to bridge gaps in workflow functionality that are identified by end users. Getting developers and users together in a room can be an effective way to hone the tools. “Developing open-source software gives you the opportunity to get feedback and implement improvements or have members of the community contribute improvements, which is something that happens in the commercial realm as well but in a very different way,” Cook says. This year’s showcase will feature about a dozen open-source tools, a significant growth from its first year when five developers participated. The projects will cover areas such as dose monitoring, critical results reporting, audience participation, radiology teaching files, and image and data transmission protocols. Open-source applications are not new to imaging informatics, but they typically take time to gain traction because they depend on input from the imaging community and, usually, word-of-mouth publicity. But that doesn’t mean they can’t become powerful tools. Cook cites RSNA’s teaching file system (TFS) as an example. In previous years, RSNA’s Medical Image Research Center has exhibited at the Open Source Plug Fest. The center is a community of libraries, including its TFS, that can be accessed as a single library. It provides digital information for teaching files, clinical and technical documents, electronic presentations, and imaging datasets for research and clinical trials. Other notable participants from previous years are OsiriX, a PACS workstation and DICOM viewer, and the National Cancer Institute’s Annotation and Image Markup tool, which allows users to add searchable information to a clinical image using defined terminologies. 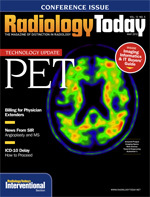 Last year, RADIANCE, a CT dose-tracking tool, received SIIM’s 2011 Imaging Informatics Open Source Leadership Award. Cook, the lead developer of RADIANCE, says it will be on exhibit again this year. Although most of this year’s participants had yet to be confirmed at press time, Cook expects that Open Source Plug Fest will draw a crowd. She says there was a lot of activity in the demonstration area last year, and she anticipates a similar response this year because attendee interest has grown as exhibitor participation has grown.